Embroidered cloth R.A.F. 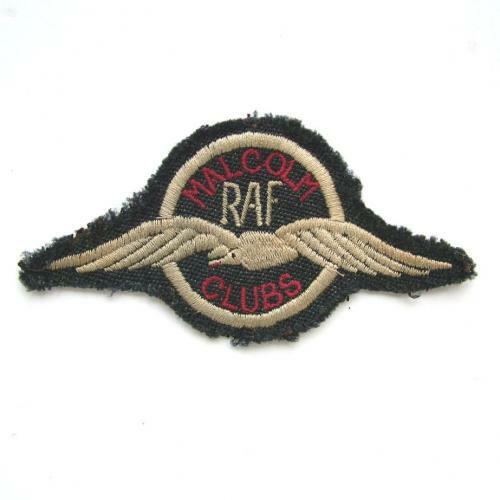 Malcolm Clubs side cap badge worn on a field service type sidecap or beret. Light soiling and minor fraying where removed from the cap, otherwise good. The first Malcolm Club was opened by Lady Tedder in Algiers during 1943. They soon increased in number with clubs in locations all over the world. They were named after a gallant young Scottish Wing Commander, Hugh Malcolm of Broughy Ferry, Dundee, who had been awarded a posthumous V.C. for operations over Tunis. The clubs provided not only food but also books, wireless, comforts and a cheery atmosphere in which aircrews could relax. Airmen regarded these clubs as their own. Rare to find. Stock code U21738.